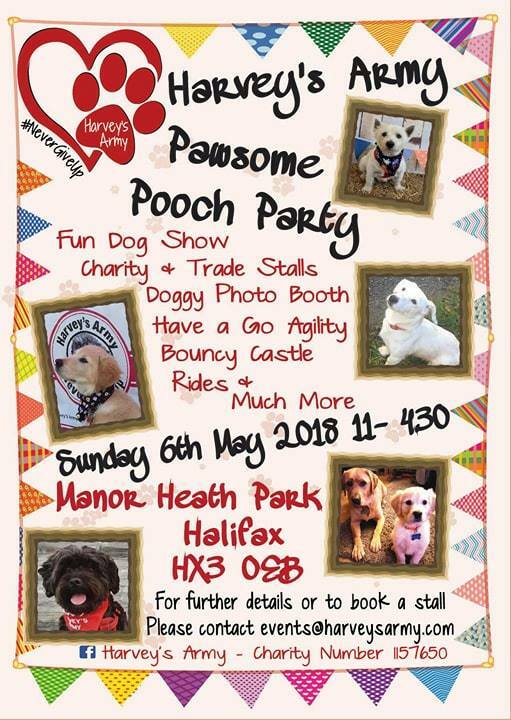 Harvey’s Army would like to invite you to our Pawsome Pooch Party on Sunday 6 May, 11:00am-4:30pm. Lots of thing to see and do. Fun activities for the pooches and their humans, lots of stalls selling lots of fab things, food and drink and fairground rides. All this and more at Manor Heath Park, Halifax. For more information email events@harveysarmy.com. Harvey’s Army are united in a love of animals and animal welfare. They have microchip scanners and a team of fantastic volunteers who will scan alive and deceased pets outside the hours of availability for vets and animal wardens in order to reunite owners with their pets as soon as possible.